When Jason Ferguson purchased his 1974 Mazda RX-3 from a mate, he had no idea of the unwanted surprise that lurked under the bright-orange paintwork, and it would be many years before it reared its ugly head. The 3 sedan had been imported a few years earlier from the motherland for vintage Mazdas — Australia. It had fresh paintwork, a 13B stage two, and was a pretty tidy, genuine car. It passed through a few hands here before taking up residence in Jason’s shed in 2008. After a year of enjoying it as is, Jason decided to pull it off the road and fix all the shortcomings, as he explains: “The main focus for that first build was the engine bay, it was basically stock, multi-coloured and pretty rough looking.” So out came the 13B stage two and long-time friend — and owner of No Cams Motorsport — Brendon Copeland built up a new 13B bridge-port. The block featured a lightened and balanced rotating assembly with high-comp rotors and a cross-drilled eccentric shaft. The old Nikki four-barrel carb also found its way into the trash and a new 48mm IDA was bolted on. While the engine was out, the bay was smoothed, painted to match the exterior and de-loomed. They also took care of the suspension, building a set of Bilstein coilovers for the front and re-setting the leaf springs in the rear. 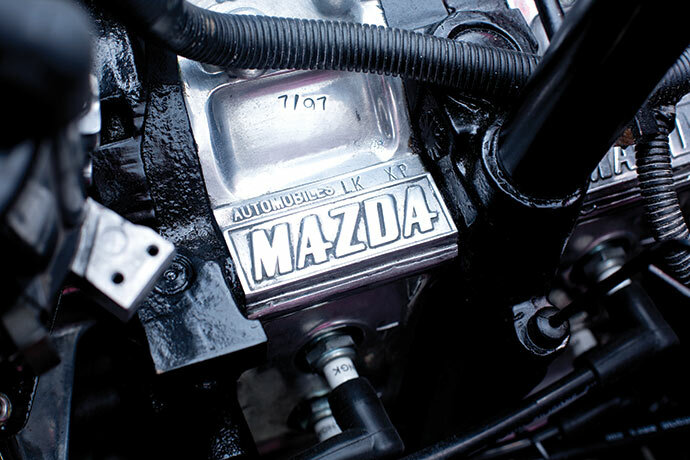 The diff was also upgraded to a modified Mazda B1600 housing with a Mazda Bounty LSD head. The shell was taken back to bare steel with a soda blaster, and thankfully the rust was no worse than being at the surface stage. Grant then took the opportunity to hammer out any and all imperfections in preparation for the new gloss black paintwork. But that was also about to change … a friend of Jason’s, who was at Powercruise the week the car was to be painted, sent a pic showing a gloss-black RX-3 sedan on polished 16-inch Simmons. So basically with Grant spray gun in hand, Jason was frantically flicking through colour swatches trying to choose a new colour. Eventually he decided on the colour you see before you, a deep and dark Ferrari Rubino. Anyone who knows Grant will know he doesn’t take things too seriously, and he took the tempting opportunity to get one over on Jason, threatening to paint the 3 in chocolate brown — Jason’s not-so-favourite colour. Grant even had his paint supplier write ‘brown’ on the paint tin. By using a brown etch on the steel, Grant really had Jason going, until the Rubino-coated shell rolled out of the booth. Now only a month out from Jason’s planned debut at the 2013 V 4&Rotary Nationals, the bare shell was towed back to Jason’s shed so assembly could begin. While the shell was being done he had sent all the undercarriage pieces, which had been rattle-canned black in the last build, off to be powder-coated, and all the alloy away to be polished, so it would be ready and waiting come the shell’s return. That last month was an extremely hectic time for Jason, as not only were Brendon and he slaving away each night until 1am to meet the deadline, but there was also the birth of his second child to contend with. But despite all the chaos the car was fired up and shipped off to GT Refinishers for the final touches only days before the event. Jason himself wouldn’t see the finished product until Grant and his team rolled it into the show. The end result is an excellent example of an RX-3, a fact mirrored in the eyes of judges as it picked up not only Best RX-3, but also the very coveted and hotly contested Best RX Engine Bay, a small reward for all those late nights carrying out a build that was never supposed to happen. Sometimes you just have to man-up and make the best of a bad situation, as Jason did, and he now has one of the best RX-3s in the country calling his shed home. 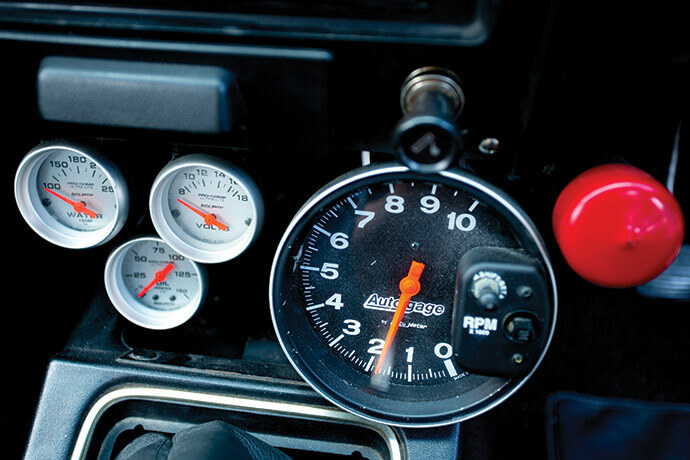 This article is from NZ Performance Car 197. Click here to check it out.